Incredible first solo release by Joseph Costa (L'Altra), pure and beautiful electro sad pop filled with piano, guitars and intense vocals. Costa Music is the brainchild of musician Joseph Costa. Joesph was once a member of L’Altra has come out on his own for his solo debut. “Lighter Subjects” sees a mix of electronic, folk and chamber pop elements all fused together. 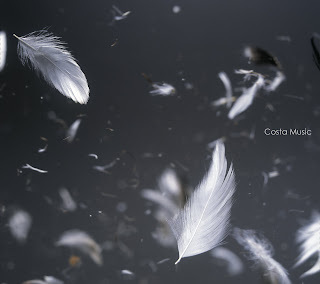 Costa also brought in a number of talented people to help out as well including Telefon Tel Aviv’s Josh Eustis to mix the record and including cellist Fred lonber-Hol and Kevin Duneman from The Race. The record on a whole has a really tender record with delicate instrumentation that can be likened to a M83 or even a The Notwist. The album starts of with “As I Go Between” gets you sucked in with its xylophone like sound and and the patting drum beat. The thing that I like about the song is how well the vocals just seem to wove together. “Feathers” could potentially become a stable in my late night listening. The song has this sense of with Costa’s dull set tones combined with that distant horns and the light trickle of a beat make this one great chill out piece. “Sounds Like A Sigh” starts off with a broken beat and some gorgeous tones are into the background in this beautiful good/evil battle. “Lack of Light” begins with this beautiful orchestra movement. Then the sad chords of the piano and crash into the vocals. Then at about two minutes in when things sound like they are going south in one of the most beautiful moments on record this year this tranquil moment just completely overtook me. “Southern States” closes off the album with this weird slightly country twang. The guitar riffs and the crashing drums and it just ends suddenly and I just simply want more. “Lighter Subjects” gives you just enough and never overstays its welcome. The nine tracks are a perfect taster for this blend of electronic and folk elements. The arrangements are incredible complex at times. From ComfortComes.